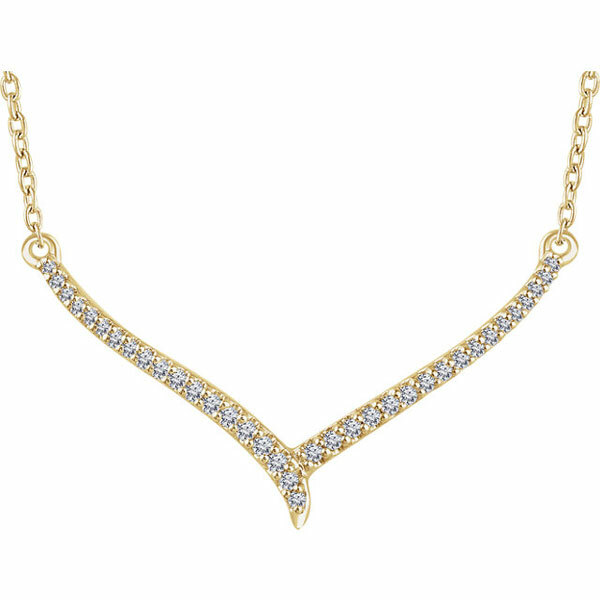 1/6 Carat Diamond "V" Bar Necklace in 14K Gold, 16" - 18"
If you are looking for something glamorous and beautiful, look no farther than this 1/6 carat diamond "V" bar necklace in 14K gold in 16" - 18" length from Apples of Gold Jewelry. 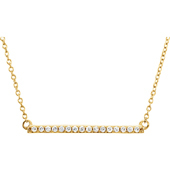 This beautiful 14K yellow gold necklace is perfect for special occasions, as it is covered in sparking diamonds. The diamonds, which go across the entire V bar pendant, are 1/6 carat (0.15 carats) and rated H for color and I1 for clarity. The pendant measures 1 1/4" wide by 11/16" tall, and you have the ability to choose from a 16" or 18" chain length. The chain is a 1mm cable chain with a spring-ring closure. This is perfect for nights out, special occasions, or when you want to dress up with a stunning necklace! We guarantee our 1/6 Carat Diamond "V" Bar Necklace in 14K Gold, 16" - 18" to be high quality, authentic jewelry, as described above. 14K White Gold 1/6 Carat Diamond "V" Bar Necklace, 16" - 18"